A small town on the plains of Weld County is saying goodbye to the Watts family. FREDERICK, ­Colo. — A small town on the plains of Weld County is saying goodbye to the Watts family. 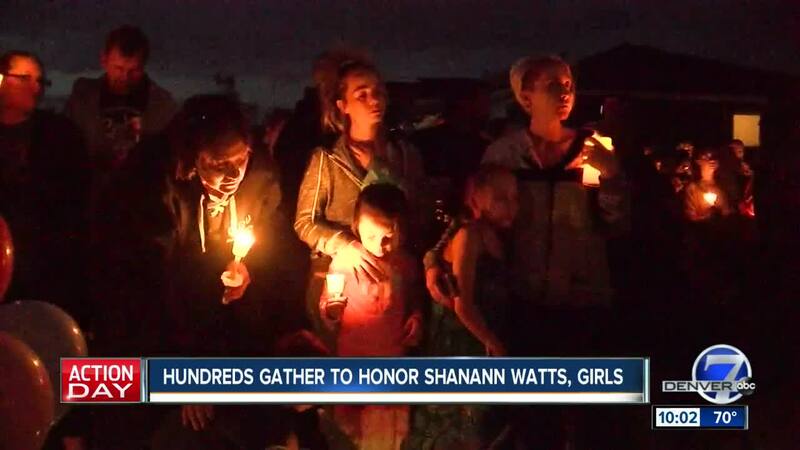 Hundreds gathered during a candlelight vigil held Friday evening in front of the Frederick home, 2825 Saratoga Trail, where Shanann Watts, 34, and her two young daughters, 4-year-old Bella and 3-year-old Celeste, lived. Her husband, 33-year-old Christopher Watts, was arrested on suspicion of killing his family and dumping their bodies on and near land owned by Anadarko Petroleum Company , where Chris Watts had been employed. Shanann was 15-weeks pregnant at the time of her death. The deaths left family and friends searching for answers. Shanann was one of the first customers to visit Ashley Bell's tanning salon in nearby Dacona two years ago. The two women quickly became friends, and before long they were texting or calling each other almost daily. Their daughters also played together during salon visits. "We were talking about general things, about how her two girls were doing and how life was out in Colorado. She didn't give me an indication that there was anything wrong. She seemed pretty happy." The town of Frederick, with a population of about 10,000, is 30 miles north of Denver in Weld County. The oil and gas industry is one of the area's largest employers.